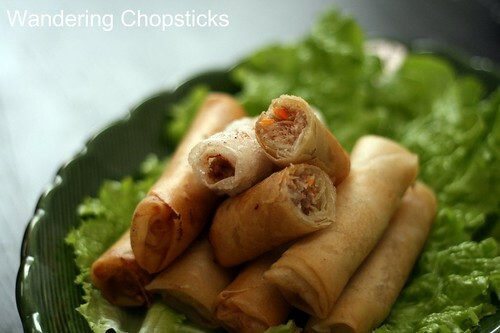 For one of my most popular recipes, it was high time I properly photographed cha gio (Vietnamese egg rolls). I remember once helping cousin T wrap egg rolls at her house. I was doing such a horrible job that she asked me not to help. :P I guess my wrapping and photography skills have improved since then. Original post below the photo. Isn't it funny how right after I eat something, I keep getting cravings for it again? And so it was that a few days after my dinner at Da Nang Com Tam Tran Quy Cap, I wanted some cha gio (Vietnamese spring/egg rolls). Just imagining the crispy wrapper with the tender pork and shrimp filling dipped in sweet and sour sauce with a smidgen of Sriracha hot sauce made my mouth water. Southern Vietnamese call egg rolls cha gio, Northerners call it nem ran. But to Southerners, nem is grilled ground pork patties. Is it any wonder sometimes it's like we're speaking two different languages? This recipe is really intended for non-Asians. I'm assuming if you're Asian you already have your own method. 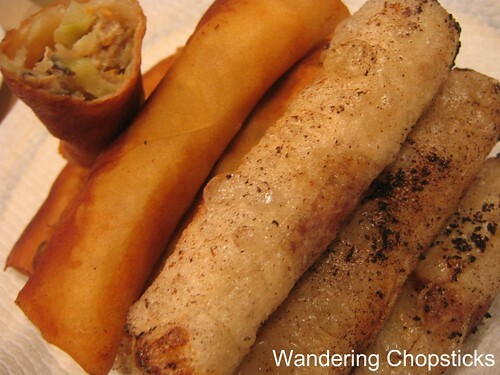 After all, the Chinese have egg rolls, the Filipinos have lumpia, the Malaysians have popiah. But I shouldn't make assumptions so this is as simple a recipe as I can make it. First off, when shopping look for spring roll or lumpia wrappers. These should be lighter and thinner looking, you don't want the thick heavy pasta-ish kind often sold in the major American grocery stores. If you want to use banh trang (Vietnamese rice paper) like they do in Vietnam, it's best to follow my recipe for Gluten-Free Cha Gio (Vietnamese Spring/Egg Rolls) to see how to work with the rice paper. The vermicelli noodles used in egg rolls should be labeled bean thread, not rice vermicelli which is a different noodle. 1 small section bean thread vermicelli. They're sold individually or in packages, but the packages will tie a small bundle together. You just need one. Optional: Ground turkey or chicken may be substituted for the pork. Add shredded cabbage if you'd like more vegetables. Add minced crab to make it even more flavorful. Vegetarians may substitute the meats with fresh tofu, just make sure to drain the excess water. Dried mushrooms, tree ear fungus, and bean thread vermicelli need to be rehydrated. Soak in warm water for about 15 minutes. If you want to speed along the softening process, use boiling water. Squeeze vermicelli and mushrooms dry and allow to drain. Cut vermicelli into two-inch segments. I use a pair of scissors for ease. Cut off mushroom stems and slice thinly. Sometimes tree ear fungus is sold pre-sliced, if not, then slice into strips. Mix everything thoroughly. To check for taste, I usually take a tiny lump of the meat and pop it into the microwave for 30 seconds or so. It's easier to adjust seasonings if necessary this way. Just remember to factor in that the fish sauce will make the mixture saltier as it gets absorbed and cooked. You should only wrap enough egg rolls for however many you plan to eat right then. They don't keep so well. 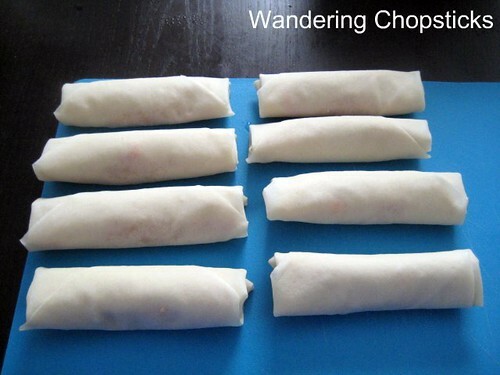 Store the filling in the fridge if you plan to make more egg rolls over the next few days. Otherwise, you can also freeze the leftover filling for use the next time you have a craving. 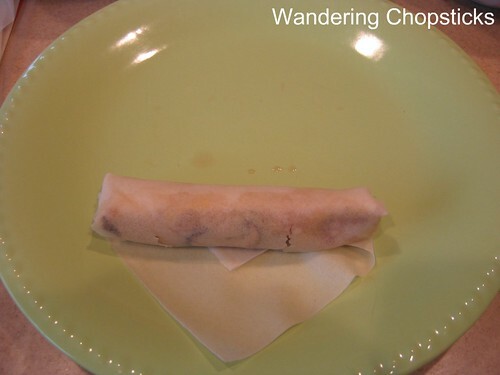 Now, in rolling an egg roll, don't be greedy. You're not making a burrito here. A tablespoon, or slightly more, is more than enough filling. Spread it out on top of the wrapper. If you're making them as appetizers for a party and want them smaller, simply cut the wrappers in half. It's easier to do this when they're still stuck together, and then separate them after they've been cut. If using rice paper wrappers, just wet the rice paper in a bowl of water or under running water. Allow a few seconds for it to get pliable and then put in the filling. Do only one or two at a time, if you try to moisten them all at once, they'll get mushy by the time you get to wrapping them. Chinese egg roll wrappers do not need to be soaked before wrapping. Fold down the top and pinch in to make the filling tight with the wrapper. Fold in the two sides where it just touches the filling. Try to keep the sides straight so the egg roll will be even. Keep pinching to hold the filling tightly inside the wrapper. It's not just aesthetically pleasing to make a tight roll, it also keeps out excess oil when deep-frying. 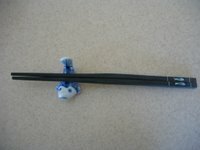 Moisten the tip to hold everything together. You could also use egg whites for this. As an aside, my brother starts his rolling from the bottom and goes up. He insists that method is reflective of him being more giving. Read: my top rolling toward me approach must mean I take and take. Do you agree? Is your egg rolling method reflective of your personality? Fill a wok or fry pan with several inches of oil, and an optional 2 teaspoons of white vinegar. 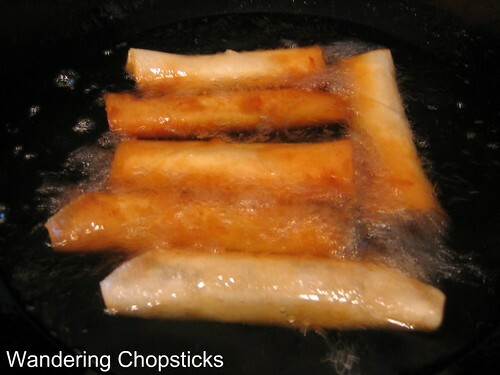 You need enough oil that the egg rolls won't touch the pan so that it can cook evenly. The vinegar helps to make the egg rolls crispy. Do this first and then turn to medium heat or else the vinegar will make the oil splatter. As for oil, don't use olive oil because it has a different heating point and isn't as effective for deep frying. The lower temperature is needed to thoroughly cook the raw meat, and allow the wrappers to reach golden perfection. Turning the temperature too high will burn the wrapper, without cooking the meat. To test if the oil is hot enough for frying, flick some water into the pan. If it starts sizzling, the oil is ready for frying. 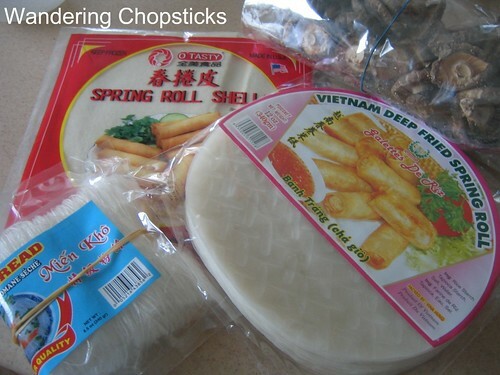 If you're using Vietnamese rice paper for your egg rolls. The wet and thicker wrapper takes longer to cook. Put the heat on medium-high so that the wrappers can puff up and become flaky, then they'll turn golden. By the time the wrappers are crispy golden, the filling should be cooked. If you're making both methods, cook the Chinese egg roll wrappers first and then turn the heat up to fry the Vietnamese rice paper-wrapped egg rolls. Otherwise, at a lower temperature, the Vietnamese rice paper won't puff up and will remain white long after the filling is cooked. I had a question about smells. My mom used to have a portable burner and did all her frying and smelly cooking either outside or in the garage. I just crank up the vent and the air purifier on high and let it get to work. The air purifier usually gets rid of the smell by the end of the day. I learned this trick from a Jewish cookbook on how to keep Latkes (Jewish Potato Pancakes) crispy. Drain on brown paper bags, it'll absorb oil but won't make the egg rolls soggy like draining on paper towels will. Allow to cool and serve with Nuoc Mam Cham (Vietnamese Fish Dipping Sauce) or just plain. Or wrap an egg roll inside a lettuce leaf and herbs and eat them southern Vietnamese-style. The Vietnamese rice paper wrapper is the one in white. Rice paper wrappers usually end up slightly chewy in the center, light and flaky on the outside, but Chinese egg roll wrappers are a good reliable favorite. And now, a look back. Eek! 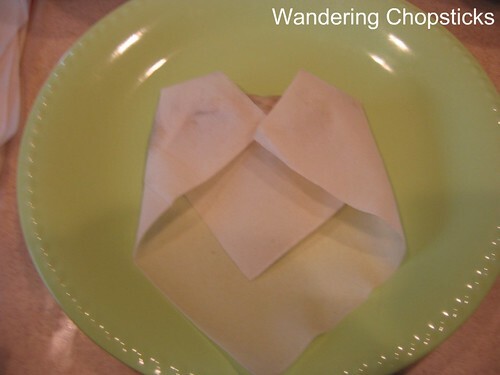 My attempt to redo the recipe using rice paper wrappers in October 2008. But the lettuce I chose was much too dark to be aesthetically pleasing. The original photo in January 2007. Oh man! I didn't even bother to clean the oil! The things I've learned since. Wow, these look great! My family doesn't make them anymore (i dunno why!) and i didn't really know how to make them. Those are some good tips, btw (thinner rice paper, vinegar...I would have never thought of that). I've never heard of vinegar in oil to make the egg rolls crispier. Interesting! Yummy - the more shrimp in the egg rolls the better. hehehehe - Becareful with the grease fire, how about sticking a stalk of a green onion into the oil if it bubbles around it it's ready? Wow these look tasty. What kind of cooking oil do you use? Any pointers on how to not stink up the house with the smell of cooking oil? Glad you like my tips. Just flick a drop or so of water, no grease splatters that way. I just use regular vegetable or canola oil. My mom used to have a portable burner and would cook smelly foods outside or in the garage. I just crank the vent and my air purifier on high. Smell is usually gone by the next day. Air purifiers are awesome! Oh, I cannot wait to have someone make these for me! :-) Thank you! Came across your website last night and bookmarked all my favorite recipes... today was the first day I tried your recipes and it was this one, for Imperial Rolls. 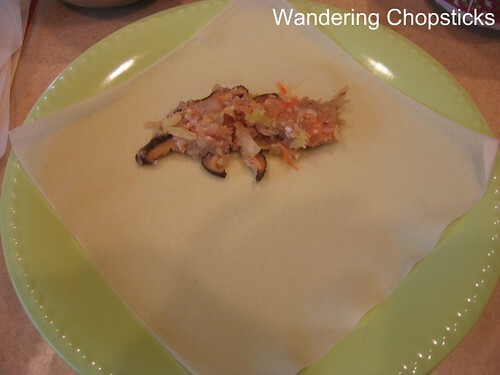 I followed everything to the T, plus I added 1/4lbs of minced up shrimp and I used the rice paper... DELICIOUS!! Tastes just like the ones at the restaurant and I love the fried rice paper because it gives that crisp chewy texture. YUM! I've made 4 and I have enough filling to freeze for later, I could probably make 30 more! Thanks so much for the recipe! Welcome! I'm so glad my recipe turned out so well for you. Please let me know if you try any other recipes! I'll have to try your tips: vinegar in the oil, draining on brown paper bags and cranking up the air purifier. My husband tends to overstuff the rolls. The last time he made some, I told him "tastes great, less filling." I hope my tips help! I love my air purifier. I keep it in my kitchen and crank it up when I'm cooking. Love your blog. Just a simple suggestion to get rid of cooking smells...light a couple of candles. Not sure why it works, but it does! 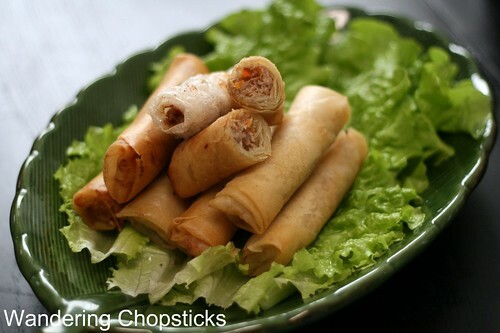 Hi, I want to Thank You very much for your recipe for vietnamese egg rolls w/sausage/shrimp plus ask a question. My vietnamese neighbor made them for me and they had a unique flavor (sauce). What sauce do you think vietnamese add to their meat mixture to give it that unique flavor that makes it takes vietnames instead of american. My husband loves your recipe without the sauce but I would like to add whatever sauce would make it taste more vietnamese/oriental. Someone recommended Golden Mountain? Do you agree? Again, thanks thanks thanks. We love your recipe! The unique Vietnamese "sauce" and taste is the fish sauce I mentioned in the recipe. Gold Mountain is soy sauce. While I do cook with soy sauce, it's far better to flavor the meat mixture with fish sauce. I prefer Three Crabs brand if you're wondering which one to try. No, no. 1 or 2 tblsp of fish sauce would be way too salty. Start with about 2 TEAspoons per lb of meat. After mixing, pop a small amount in the microwave and do a taste test. Just remember that the saltiness of the fish sauce will increase as it gets absorbed into the mixture. Yay! I'm glad it worked and that you liked the recipe. Thanks for the recipe! I made a slightly different version of this recipe today, and it turned out great! Glad it worked out for you! Thanks for trying my recipe. I made this Sunday night and they were excellent! 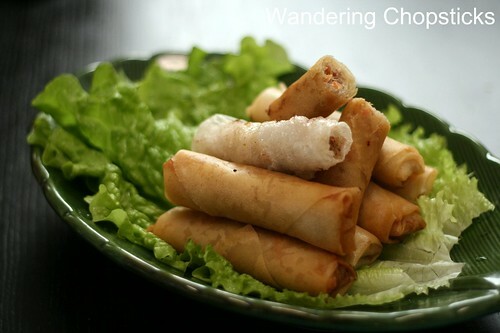 I had a quick question though--are there any tricks to frying the cha gio wrapped in rice paper? I added the vinegar to the cold oil, heated it until the vinegar was bubbling furiously, then slid the first cha gio in. But five seconds later, it exploded dramatically all over the kitchen, sending hot oil onto me, my friends, the ceiling...what did I do wrong? If you're making cha gio with rice paper, you have to let them thoroughly dry before adding them into hot oil. Oil and water don't mix and that's probably what caused the explosion. You can also try using a splatter guard. I used a splatter guard after the first explosion, but I also poked a hole in each one before I fried it and they turned out fine. I'll let them dry more thoroughly next time, but I certainly didn't put them in the hot oil soaking wet. Also, can you tell me more about adding the vinegar to the oil? I've never heard of anything like that before, and am curious. Thanks! The vinegar was a tip I picked up somewhere a long time ago. It seems to keep the wrappers crisp and firm so I continue to use it. Not sure what science is behind that. But if that's what's causing the explosion, then just omit it. You really don't want to poke holes into the egg rolls since the whole point of wrapping them tightly is so oil doesn't get into the filling. 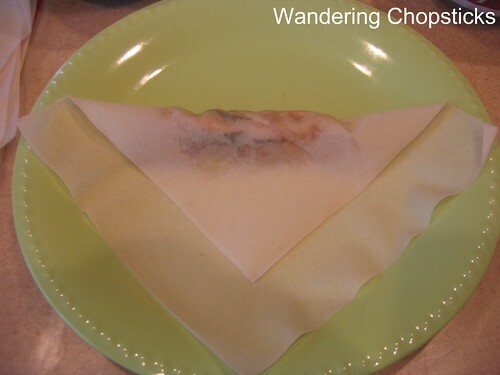 I usually let the rice paper wrappers sit out and dry up for a while before I fry them. This is the next recipe I will try. After my success with Pho Bo I feel confident trying this out. I want to sincerely thank you for this recipe. Growing up, I was always shooed out of the kitchen by my mother and never really learned how to cook my "comfort" food. But I was always tasked with grating the carrots and jicama, which I never complained about because I would eat the jicama and carrots before I grated them anyway. Maybe that's why I wasn't allowed in the kitchen. Anyway, my search for egg rolls usually brought disappointment because they would come close to my mother's, but it was always off by a small margin. Which made me realize that I can make my own at home. One day I did and the egg rolls EXPLODED! Don't ask me how, but that failure discouraged me from trying again. The discovery of your blog has changed my culinary life for the better. Thanks to you, I am able (with mediocre confidence) to make the foods that brings me comfort and joy (without a small explosion) and take pride in my work. Last night, I successfully made egg rolls, and they were edible this time! I did modify the recipe a bit and forgot one ingredient, but the delight that I had when I bit into the crispy (not burned) egg rolls almost made my cry. In a perfect world, my mother would give me those small notes and tips, the same notes and tips that you include in your blog/recipes and for this, I truly and sincerely thank you. My mom wasn't much for teaching me how to cook either. She just put me to work, same as yours. I'm always so happy when I help someone recreate comfort foods. (Had a lengthy post but lost it after signing in). Just wanted to say thank you for the fab recipes. Tried cha gio as I was craving vietnamese food (no such thing here in harrow, England... I so miss the Bay Area), and it turned out great! My official taster, my very food-fussy 18 mo. old son, gives it his "Mmmmm" of approval. Even my fish-sauce-aversed, hubby loved it (his exact words:"now, I can eat a mountain of that"... unfortunately, I only left him a half of a roll). I'm making 'em again tonight and will try your Ga ro ti to go with the cha gio. Many thanks again for making scrummy food recipes accessible to people like me. Aww, I love when I hear from you. Especially when you tell me how much your family loves something you made from my recipe. 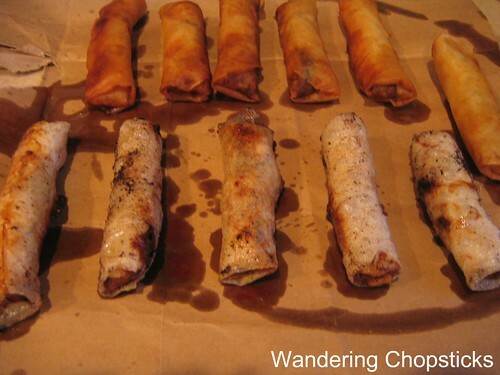 Finally found a recipe that matched what I consider the best fried spring rolls in the nation. (and I've eaten them from SF to NYC) It's a little place in Greensboro, NC (of all places) called Ly's Vietnamese. I've never (in the past 20+ years) been able to get the recipe, but this recipe is spot on. Thanks so much. One comment...I tried the rice paper skins first and it was a disaster. (they are probably great for summer rolls but not in a fryer) Switched to what I assume are flour based spring roll wrappers (Wei-Chan brand) and they came out perfect. Thanks so much!!! Aww, thanks! Your comment totally made my day. I've been meaning to re-do the photos for this old post, but it's nice to know it's still got plenty of life, even with my awful old photos. The rice paper skins are tricky for some people, but I like Chinese wheat wrappers just fine too. I love, love Vietnamese food and am planning to have some this weekend in fact. I'm Vietnamese. I think you really like my country's food, i like it too. Vietnam have lots of tasty foods. Do you know Phở? It's the best food that everybody like. I keep telling to myself that I should stop to have fear of making nems but I never gather enough courage to make them (and I already have ALL the ingredients). One of these days, I'm going to have to make cha gio. It's been on my to-do list for a long, long, long time. Umm, you didn't bother even paying attention to the blog, did you? Why are you afraid? They're so easy to make! Indonesians call this lumpia too which is derived from lunpia :) Famous lumpia of Indonesia is the Seamarang style, filled with shrimp and bamboo shoot. Ooh! I love bamboo shoots. Will have to try that variation. I'm very late to the game in finding this blog, but I am so very excited to start trying to cook all of these Vietnamese recipes you've posted! I'll be making a trip to an Asian food store soon, where I imagine I can get all the ingredients that I can't find easily elsewhere, but can you explain ground shrimp to me? For some reason I can't decide if it's like ground meat, or if it's a powder-ish thing I've seen when googling for it. I just meant freshly ground/minced shrimp. Peel shell and puree in food processor. There is powdered shrimp, but that's not what I'm calling for in this recipe. It never occurred to me that someone would get that confused. I'll change the wording in the recipe then. Thanks for pointing it out. Thank you so much! Most likely no one else would be confused, but I made the mistake of googling it just to make sure it wasn't something I'm unfamiliar with, haha. I'll be trying it out this weekend, as part of the Bun Thit Heo Nuong, Tom, Cha Gio recipe. I tried making these yesterday, they came out delicious! The only thing is my egg rolls are no where as pretty as yours. I've made sure they are completely dry and that the oil isn't to hot but for some reason they are developing tons of these tiny little bubbles around the rice papers once I fry them. Any pointers? WC, I do prefer the red leaf lettuce over regular lettuce. The red leaf lettuce is softer so it folds around the rolls more easily. Great post. I think the only difference between my recipe and yours is that I add a bit of mushroom seasoning that adds an 'umph' taste to it. No problem. Sometimes I overthink things too. It just takes lots of practice. Just look at my ugly earlier photos. I like the tiny bubbles around the rice papers and it's perfectly normal so there's nothing wrong when that happens. If the banh trang cha gio are too pale to photograph, maybe you can use this trick that I read in a Vietnamese cookbook-- dip the banh trang cha gio in sugar water before frying. It should give them a nice golden sheen. I've never heard of that before! Makes sense though? The sugar will burn and color the rice paper? 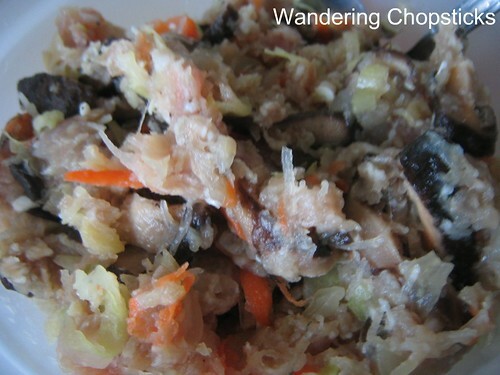 The steamed filling recipe is cha trung. But yes, it's the same as this filling with another egg added. Thanks for your kind words. I just found your great blog! I grew up eating cha gio and now make my own. Do you have any suggestions about keeping the oil clean while frying? I use rice paper wrapper because it's traditional. But, I've noticed that there are more particles when I fry with this wrapper. Any suggestions? I don't have too much problem with the oil while frying, it's afterward that I have all these black fried bits to clean out. After the oil cools down, I drape a paper towel inside a strainer and pour the used oil into that. Then the oil can be reused again. If you've got too many particles while frying, maybe you're not wrapping the egg roll tight enough? You shouldn't leave any gaps for the oil to seep in or for food particles to get out. It took me a while to learn how, as you can see the black particles in my early pictures of this recipe. Haven't made these from your recipe yet, but this sounds just like what my (Vietnamese) mother made when I was growing up. I loved these with the rice paper. I've tried unsuccessfully to make these from my mom's instructions so I'm grateful for your article. Thanks! Going to try it with your instructions. Are your mom's instructions "a little bit of this and a little bit of that"? Like every Vietnamese mom's instructions. :P Hope you like them! Thank you for share. I like food. A few thing also good in spring rolls is my favorite taro, to my kids favorite jicama. Taro and jicama are great in egg rolls. Provides a nice crunch. Try Googling "Manila" and "Vietnamese grocery store."